FranklinCovey Style Guide: For Business and Technical Communication can help any writer produce documents that achieve outstanding results. Created by FranklinCovey, the world-renowned leader in helping organizations enhance individual effectiveness, this edition fully reflects today’s online media and global business challenges. 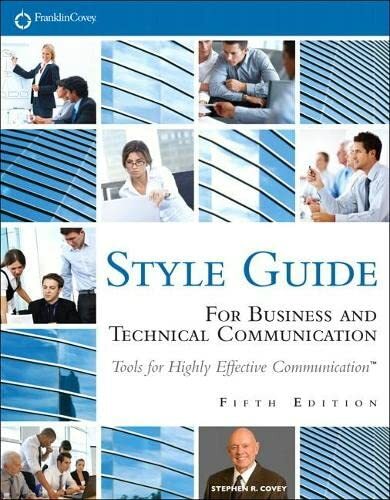 The only style guide used in FranklinCovey’s own renowned Writing AdvantageTM and Technical Writing AdvantageTM programs, it covers everything from document design and graphics to sentence style and word choice. This edition’s many improvements include extensive new coverage of graphics, writing for online media, and international business English. Through dozens of examples and model documents, writers learn how to overcome “writer’s block” and efficiently create documents from start to finish. FranklinCovey’s experts show how to get powerful results from every email; add distinctiveness and power to any online presence; write far more effective proposals, letters, memos, reports, and resumes; and improve all forms of documentation, from business procedures to highly technical content. You’ll learn how to quickly discover and prioritize the information you need, whether you’re planning a presentation, leading a meeting, or managing a project. The authors reveal how to design visuals that communicate messages instantly and intuitively, and use charts, color, illustrations, maps, photos, and tables to supercharge any presentation. Packed with up-to-the-minute examples, this A-Z guidebook can help you write more effectively no matter who you are — whether you’re a business or sales professional who must motivate and persuade, a technical professional who must explain challenging content more clearly and accurately, or a student who needs stronger writing skills to succeed in school and in your career. · Produce documents that reflect quality writing standards. · Access more than 110 topics from A to Z, covering everything from document design, graphics, and parts of speech to punctuation, sentence style, and word choice. · Create documents from start to finish and avoid writer’s block. · Write effective letters, memos, and resumés with the help of more than 30 model documents. · Design effective, understandable graphics that enhance and convey your message. · Discover and prioritize information. FranklinCovey is a leading provider of leadership, personal productivity, and effective communication workshops. Two programs—Writing Advantage™ and Technical Writing Advantage™—help you learn how to write documents that achieve the results you expect. Both workshops feature the FranklinCovey Style Guide. The most current guidelines on email, information management, and online documentation. Learn how to manage the flood of email coming at you and get results from the email you send. Find out how to add distinctiveness and power to your online presence. Updated best practices for graphics. Here’s the best current thinking on visuals for documents and presentation, charts, color, illustrations, maps, photos, and tables, including all-new examples. Guidance on global English.There is a new section on English as a second language for business professionals, as well as updated guidance on international business English. Valuable new insights for knowledge workers.Learn new ways to think and process information better in updated sections on thinking strategies and the writing process, as well as practical guidance for managing projects and meetings. Model documents for today. As email has overtaken traditional business letters and memos, you need new models to follow. See the Model Documents section for updated samples of sensitive emails, reports, proposals, procedures, and resumés. Everything in this fifth edition has been updated to help you meet the communication challenges of the high-tech, high-demand business world of today. In 1996, Stephen R. Covey was recognized as one of Time magazine's 25 most influential Americans and one of Sales and Marketing Management magazine's top 25 power brokers. Dr. Covey wasthe author of acclaimed books, including the international bestseller The 7 Habits of Highly Effective People, which has sold more than 20 million copies in 38 languages throughout the world. Other bestsellers authored by Dr. Covey include First Things First, Principle-Centered Leadership, The 7 Habits of Highly Effective Families, and The 8th Habit: From Effectiveness to Greatness. Dr. Covey’s most recently released books include Everyday Greatness: Inspiration for a Meaningful Life (2006), The Leader in Me: How Schools and Parents Around the World Are Inspiring Greatness, One Child at a Time (2008), Predictable Results in Unpredictable Times (2009), Great Work, Great Career (2009), and The 3rd Alternative. Dr. Covey was co-founder and vice chairman of FranklinCovey, the leading global professional services firm with offices in 123 countries. FranklinCovey shares Dr. Covey’s vision, discipline and passion to inspire, lift and provide tools for change and growth of individuals and organizations throughout the world. Dr. Covey held a BS in Business Administration from the University of Utah in Salt Lake City, an MBA in Business Administration from Harvard University, and a doctorate from Brigham Young University. He also received 10 honorary Doctorates. He made teaching principle-centered living and principle-centered leadership his life’s work. Dr. Covey lived with his wife Sandra in Provo, Utah. He was the father of nine, a grandfather of 52, and great-grandfather of four.